The Women in Science series features women scientists from across the Southern Research Station (SRS) – their education, career paths, challenges, achievements, and inspirations. Mitchell operates a chipper using a remote control. Photo by Wes Sprinkle, USFS. Mitchell knows all there is to know about forest operations technology. She gives advice on cutting, mulching, trucks, machines, and work shifts. How do you modify a trailer to haul untrimmed trees? What is the purpose of designing different shear heads for feller bunchers? How do you study the effects of biomass removal on water quality? Dana Mitchell knows the answer. Though she spends time on computers and in the lab, she is frequently out in the field collecting data. Mitchell spends much of her time studying biomass and bioenergy. Involved with many levels of production, she has even tested her ideas at a power plant and introduced a new piece of equipment to their market. 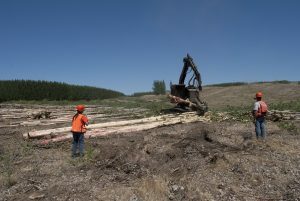 While studying forest management at Washington State University, Mitchell developed an interest in harvesting and economics. In her early career, she explains, she sometimes had a sense that she had to work harder to prove herself because she was a woman. Mitchell investigates if stripping bark from poplar trees during harvesting operations can improve wood quality for biofuel use. Photo by Wes Sprinkle, USFS. Since then, she thinks that the Agency has come a long way in terms of embracing diversity. 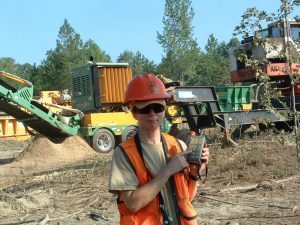 Along the way, she has lived all over the country and done a variety of different jobs for the Forest Service. Now, she holds a leadership position. Her work is rewarding. “What better goal can you have than to work as a public servant to help sustain the health, diversity, and productivity of the Nation’s forests and grasslands?” asks Mitchell. Mitchell encourages young scientists to try new things, take new opportunities, and ask questions. What is a typical work day like for Mitchell? How often does she encounter dust clouds and bug spray? Visit Women in Science to learn more about Dana Mitchell and other SRS scientists. For more information, email Teresa Jackson at teresajackson@fs.fed.us.